In the autumn of 1994, when I was last working at Cycling Weekly, I was the guinea pig for a series of articles about the new-fangled training techniques that were causing ructions in every club in the land. Almost overnight, the terms ‘sprint intervals’ or ‘LSD’ or ‘fartlek’ became obsolete and were no longer heard in club training discussions. Suddenly, the talk was of doing ‘two hours at upper level two’. A combination of cheap, accurate heart-rate monitors, allied to the growth in sports science research, affordable computing power and the British-designed Kingcycle ‘turbo-trainer’ all played a part in a paradigm change in training. These various developments meant that a rider’s training could be set and monitored using their heart rate to determine specific training loads. A ride to the cafe was no longer an excuse to check out the carrot cake – it was a ‘level one’ ride. And instead of thrashing yourself doing vague ‘intervals’, riders were riding at ‘threshold’ between ‘level three’ and ‘level four’ with one eye on the Polar Sport Tester strapped to handlebars padded out with pipe-lagging foam. Riders were now ‘on the watch’ as well as on the rivet. At the time, it was revolutionary. Inevitably, as with any new ideas and technology, there was resistance and confusion. The old guard, riders who were already doing well, current and ex-pros, were openly scornful. Boffins in white lab coats coaching riders, what did they know? Failed third-cat racers! It all went against the grain and, on the surface, appeared to be undermining decades of cycling culture and practice. Consequently, the idea of ‘levels’ of training using heart rate was treated with extreme suspicion in some quarters. However, there was massive interest from riders who noticed top Continental pros riding with Polar heart-rate monitors prominently displayed on their wrists and handlebars. In the UK, the successes of Gan pro Chris Boardman and his then coach Peter Keen persuaded many that this ‘training levels’ technique might actually have something going for it. It was all new and exciting, with terminology that was bewildering to the non-sports scientist. But, of course, all a rider wants is to go faster, and if these numbers were going to help me, I didn’t care too much about the physiology. I just wanted to know how I could get the most out of my limited training time. The man pressing the keys on the computer and doing his best to encourage and explain what was going on in 1994 was fellow Scot Dr Richard Davison, no mean rider himself, a cycling coach and chief sports science support to the Scottish national team. For the next year, he had to put up with all manner of dim questions, phone calls and faxes. Yes, that’s right, faxes. We’re talking about an era that was at the dawn of email, when the internet was in its infancy both in terms of reach and access. Throughout the winter of 1994 and into 1995, CW ran a series of seven articles trying to explain the principles of training using heart-rate monitors and turbo- trainers; there was even a feature on nutrition that suggested, somewhat heretically, that glucose polymers in your water bottle were better than eating solid food during a ride. A small new company in Blackburn called Science-in-Sport was developing some new powder and using Boardman as a guinea pig. 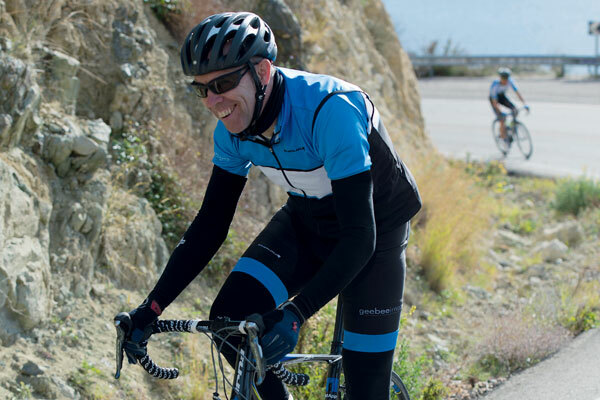 Cycling was undergoing a seismic shift in terms our understanding of training in every area. 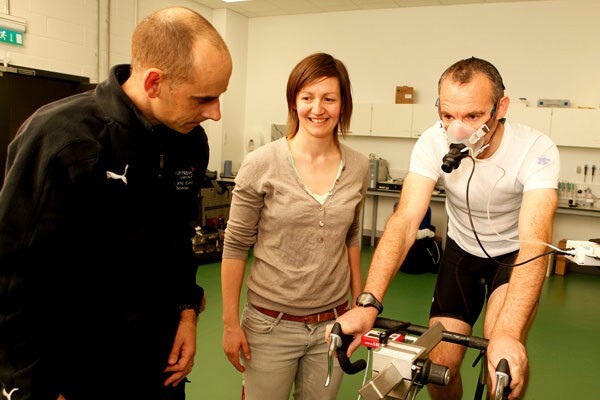 The Kingcycle test – which I underwent in 1994 and which was widely available in the UK, as each centre of excellence had access to one – involved the rider setting up their bike on this high-end turbo trainer, the lab technicians calibrating it and monitoring the rider’s heart rate and breathing as the load on the Kingcycle was increased. It might seem curious now, but in 1994 the focus of the test was much more on the rider’s heart rate than on power output. Of course, at one level the score that everyone was interested in was the amount of power measured in watts expressed as watts per kilogramme of body weight. 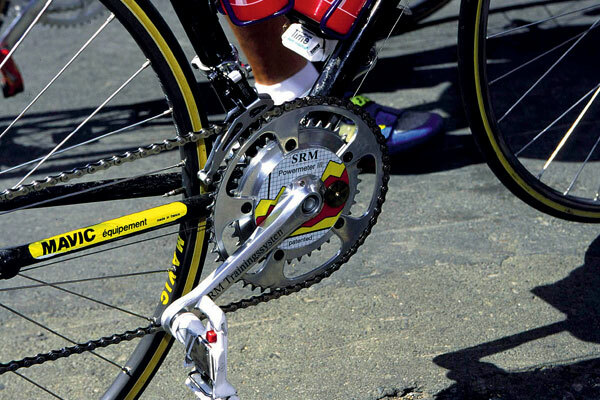 But, since nobody but a handful of top European pros (Greg LeMond was an early SRM adopter) had any means of measuring their power output outside of a laboratory, the useful numbers from a rider and daily coaching point of view were those heart-rate figures. However, accurate measures of the heart rate under stress meant that training zones could be tailored and subsequent interval sessions ridden on heart rate rather than specific power outputs as they are today. 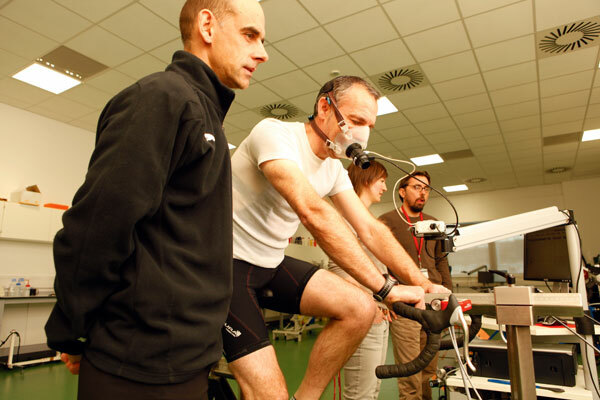 Using the analysis of the exhaled gases – the point at which there was a significant increase in the amount of carbon dioxide exhaled – the sports scientist could work out a more accurate threshold training zone, backing up the data from the individual rider’s heart rate. My first test, in 1994, was done off the back of a daily hour each way riding commute to CW’s offices in central London with the odd two-hour midweek excursion and weekend ride thrown in. I had raced in Scotland in the mid-1980s, though it was hardly a distinguished ‘career’. In fact, I was probably the worst third-cat in Glasgow and District, my only prize was as lantern rouge in a 90-mile road race. I staggered into the race HQ 40 minutes after the winner, and the only thing on my mind was to find out if there was some cake left. In short, I hadn’t trained or competed since 1988 and I had taken eight years off when working abroad. Thus, aged 33, I was in decidedly average shape in September 1994 and the figures from my Kingcycle test didn’t lie. Two months later – eight weeks during which Dr Davison introduced me to the dubious delights of interval sessions on a turbo-trainer – I went back to be re-tested. Thankfully, the numbers were better. A bit more power and – very helpfully – a bit less fat, given that I had somehow managed to get down to 68kg. Even if my power output hadn’t improved dramatically, my miserable wattage had less lard to push up those Surrey hills. For the next two years, I rode in the Surrey and Kent road race leagues, did some early-season hilly time trials and performed better than I ever had in Scotland when I had been 10 years younger. Now, although that’s not saying much, you can only work with what you’ve been (genetically) given! Looking back, with the benefit of two decades of hindsight, I should have been more pleased with the progress. And then, at the end of 1997, I changed jobs and stopped racing, then stopped training, and essentially stopped riding my bike. Like most ex-club riders, I still dug the bike out of the shed in the summer, but if I did more than an hour, it felt like an epic, though the pace could barely be described as pedestrian. However, a change of job in April 2012 and the astonishing turnaround in the profile of road racing meant I was keen and curious again. Strava reveals that in 2012 I rode for 171 hours in 103 rides totalling 4,138km. What genetic scientists are investigating – and what could become reality. A body cell developed through genetic engineering which could be engineered to produce continuous doses of banned substances under the skin. Eleven years ago, extra copies of EPO genes in mice cells raised haematocrit levels from 49 to 81 per cent, for over a year. Investigations are ongoing. The gene for ‘turning off’ natural production of EPO has been successfully cloned. If HCP was re-introduced into the body, scientists could regulate the body’s production of EPO. Permanent changing of genes means that – in theory – scientists may be able to design athletes from birth. Scientists calculate that 40-60 per cent of a human’s performance capacity is inherited. More and more ‘performance’ genes are being discovered, particularly those relating to sprinting. Some ‘anti-performance’ genes, such as Apo-E, have been found. This is much further into the future, perhaps, but in theory, it could be possible to bring back former athletes from the past. Scientists are already working on projects to engineer personal ‘spare parts’ for transplantation or replacement without fear of rejection. Genetic stem cell research has shown that ‘manufactured’ organs are possible, together with the reconstitution of cartilage, tendons and ligaments. What can you do to hold back the years? In the intervening years – 19 years is long time in cycling – road cycling has undergone a huge transformation. Strava, PowerTap, Quarq, SRM, Training Peaks and Garmin Connect weren’t available in the, er, last millennium when the height of sophistication was a Cateye cordless speedo. GPS was strictly for the spooks at the CIA and MI5. Will any of these things help me? Is there any hope for me, doctor? “Of course,” says Davison, offering the following pointers – to me and the rest of of the swelling peloton of 40-something riders. So, I appear to be about as bike-fit now as I did at my first test – in terms of watts produced. OK, so a few months of training back in 1994-95 by the 34-year-old me would lead to decent improvements that would leave behind the 2013 me, but I’m determined to see if, with new training techniques and the cunning that comes with age, I can get close to where I was 19 years ago. If this new technology is really as smart as people say it is, well, what could possibly go wrong? So, how did the 52-year-old me compare to the 33-year-old me tested by Dr Davison in 1994 and 1995? The answer, reassuringly for all concerned, is not too badly. These days, the maximum power I can maintain for a minute is actually a little higher than it was back in 1994. Not much, though – my one-minute max power was 324W, compared to 313W in 1994 – and we have to bear in mind that we didn’t replicate the test on the same strain gauge technology – Kingcycle then, SRM now. So, although the power outputs wouldn’t stand scrutiny in an academic paper, they’re good enough for our purpose here. 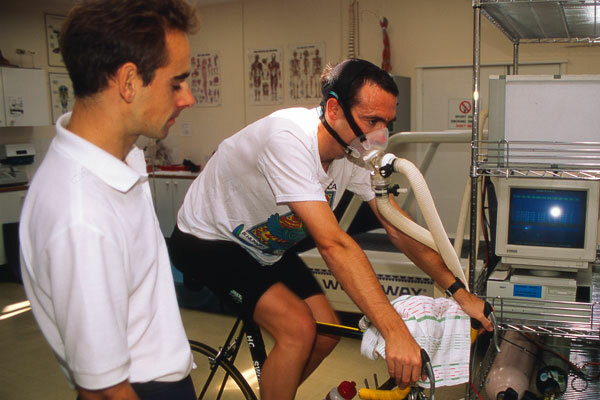 My 1994 VO2 max – the maximum amount of oxygen I can extract from the air I breathe and transport to my muscles – was 4.1L/min/kg and now, 19 years later, it has dropped to 3.7L/min/kg a decrease of around 10 per cent. “That’s more in less in line with what you would expect to see in a rider of your age. Regardless of your training, your VO2 max drops.” As you age, you lose lean muscle mass and gain fat, so your VO2 max drops (in part inevitable because you have less muscle) and, short of using an illegal cocktail of Human Growth Hormone and testosterone, you’re not going to escape those effects. There was one glimmer of brightness amid the coffin-dodging gloom: my respiratory fitness is better now than it was back in 1994. Yes! Get in! I’m ‘fitter’ in one respect. It seems that I am now able to take more breaths in a minute – 50 a minute this time compared to 43 in 1994 – working flat-out, than I could previously. “Last time you could get 109 litres of air into your lungs every minute; now the figure is higher, at 132 litres a minute,” noted Davison, pointing out that an Olympic rower will have a figure of around 200. (I confessed to using a Power Breathe gizmo for the past three months, which, suggested Davison, may well have something to do with that improvement). And, with a reduction in VO2 max comes the killer (no, not cardiac arrest, though there was a defibrillator in the Napier Uni lab), that even although my maximum minute power figure had risen, so, almost inevitably, had my weight. That unforgiving and crucial figure – watts per kilogramme – is therefore down. At my, ahem, ‘peak’ I was 65kg and produced 323W which meant I could pump out a dizzying 4.96W/kg. Almost 20 years later, I have now 4.37W/kg to haul my 74kg arse up Box Hill. It might not sound like much of a change but, if the concept of watts is hard to grasp, I’m now carrying the equivalent of nine bags of sugar in my back pockets as I grovel up hills. Nine! So I’m getting old, but the Napier University test revealed that riding as little as four hours a week has contributed to me maintaining a surprisingly respectable level of fitness. Compared to the average 52-year-old, who’s non-cycling and couch-bound, I’m much fitter, which, when you are looking for a return on your cycling efforts, is about as good as it’s going to get! This article was first published in the May 2 issue of Cycling Weekly. Read Cycling Weekly magazine on the day of release where ever you are in the world International digital edition, UK digital edition. And if you like us, rate us!